The sense of tension in the painting ‘Rooted’ (above) makes it seem the human like figure is trying to writhe himself free of something. The contours of the figure affirms this narrative: the momentum of the anatomy gives me the impression that there is a contraction of the body, a subtle struggle. The neck looks like it is stretching out or fighting against a downward pull. If the figure was looking directly at me, the gaze of his hollow eyes would almost be unbearable. I feel I am spared by the artist. The colours tell a different story. 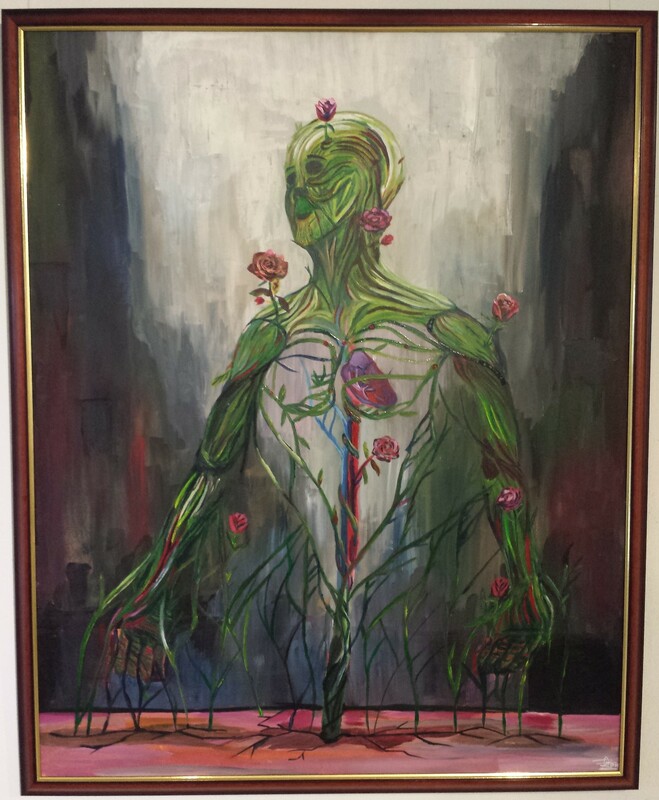 Red roses sprout and flourish over parts of the figure; red, the colour of blood symbolizes life and is aptly contrasted on the natural green of the body – these roses are a symbol of resurrection from what seem like a grim predicament I can just about read from his facial expression. A theme of nature is clear: to signify life or how natural this situation is – the human condition. If people speak of thorns on roses, then these roses assume the “thorns” of the “body” but they flourish into something else, something delicate. A sense of making the best out of a bad situation or perhaps it is the artist channelling all his frustration and sadness as a source of his creativity and artwork. Suddenly, I begin to understand, this figure assumes a posture of surrender to the very thing that keeps it in place, its roots. He knows he can’t escape it. Rooted to the very thing which holds him back from trying to be free and at the same time this rootedness is the very thing which gives him life and meaning. This is Faiz Morshidi’s work and he succeeds in expressing the productive tension of modernity that exists in Bruneian thought. Faiz’s installations express emotion and symbolism on a similar theme. ‘Limbo’ (left), project the same sense of being suspended in between origin and destination. Here, the flying creature attempts to break free but at the same time it is made up of the same white strings which suspends it in its place. The theme from ‘Rooted’ recurs. This work poses the question not of “what” I am (the distinction between subject and object) but of “who” I am (my immersion in language, culture, and time). That is, I am not a free-floating self separate from my world of objects in front of me. Rather, the world before me is part of the fabric of my being and I cannot be separated from it objectively. I am not a spectator of the world and I definitely cannot look at it value-free because I am this world, bound up and bound together, and therefore cannot seek escape it. If Faiz’s intention is yet again an expression of frustration then he, even if unintentional, succeeds in exploring the “indefinable things that are felt by people”. Two other works are on display, ‘Mymosa’, a tribute to the lightness and vulnerability of being, and ‘Excrutiation’, a sculpture perhaps autobiographical in nature imprinting the artist’s frustration as a source of creativity. The abrupt change in medium displays his versatility as the cold steel-like exterior of ‘Excrutiation’ is put in contrast against his two paintings with its imagery of nature. 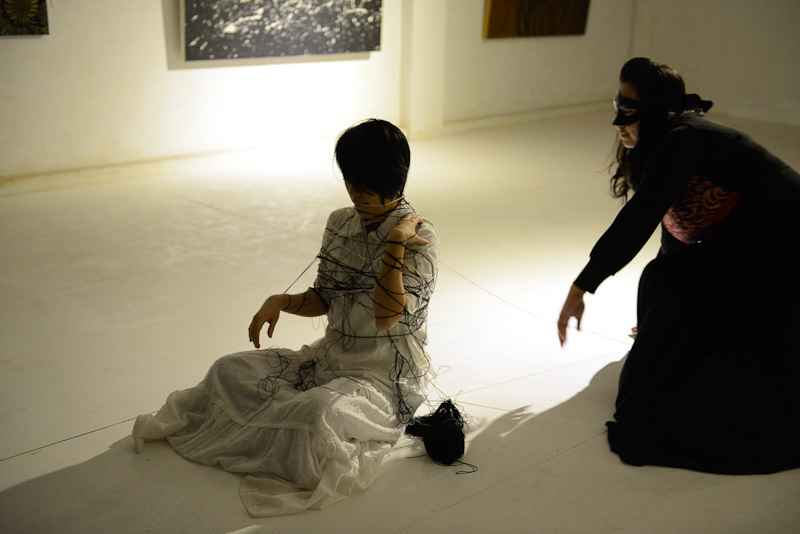 Elsewhere in the gallery there is an eclectic array of artworks and performance art. Nur Khalisah’s installation succeeds in engaging the observer in a sort of subconscious vertigo aptly placed alongside her drawings. Her work induces a feeling of movement in a series of lines and shapes and they invoke something psychological in the viewer. It does make one ponder precisely what goes on in the artist’s mind in producing their artwork. A question Sam Siren tries to address in her highly abstract pieces from the images influenced by Alice in Wonderland to the more experimental (and cerebral) paintings. The power of imagination by these artists is no doubt exemplified in the illustrations of Winnie Cheng. Her set of illustrations, most notably Sky Whale, does call for a return for its own time and reflection. Such is the demanding detail of her work, one could look at a portion of an illustration and open up a world that is infinite in itself. Finally, the performances by Temperatie and Nur Khalisah on the opening night gather the work of these artists in the exhibition under a unifying theme of movement, and of course ‘Expression’, not just of physicality but one that is under the force of thoughtful reflection on how to express something that is deeply personal. Temperatie’s performance captures the tension of the self and it is interesting in a sense that some spectators might deem the performance as a nod to the spiritual. Though this article is centred on Faiz’s work, myself and the Open Brunei team sincerely look forward into trying to engage more with other works on display in this exhibition and hopefully in others to come. This is the nature of art, it demands time and it requires an awareness of moods to fully engage what is being presented. 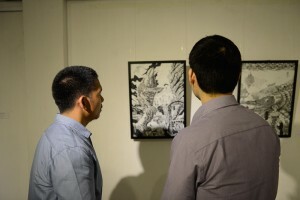 This is why I commend the efforts of Kaleidoscope Studio in organizing this successful exhibition breathing a fresh lease of life into Bruneian art. Expression is an art exhibition organised by Kaleidoscope Studio. Five artists are putting their work on display: Faiz Morshidi, Nur Khalisah Ahmad, Sam Siren, Temperatie, and Winnie Cheng. It is held in different venues: 9-15 February @ Saffron Cafe Kiulap, 16-22 February @ Alliance Francaise, 23 February – 1 March @ The Souq. For more info visit their Facebook page. The sense of tension in the painting 'Rooted' (above) makes it seem the human like figure is trying to writhe himself free of something. The contours of the figure affirms this narrative: the momentum of the anatomy gives me the impression that there is a contraction of the body, a subtle struggle. The neck looks like it is stretching out or fighting against a downward pull. If the figure was looking directly at me, the gaze of his hollow eyes would almost be unbearable. I feel I am spared by the artist. The colours tell a different story.